No crafting today. We tootled into Truro to do a bit of shopping before heading down county to the tiny cove of Mullion with it's walled harbour and rugged shore line. 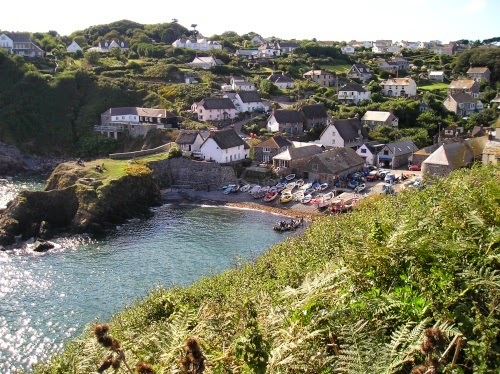 Then we headed west of Lizard Point to Cadgwith, one of the most picturesque fishing villages in Cornwall to visit friends who live in the house top right of the picture below. We called to see Sally in the Crows nest too. 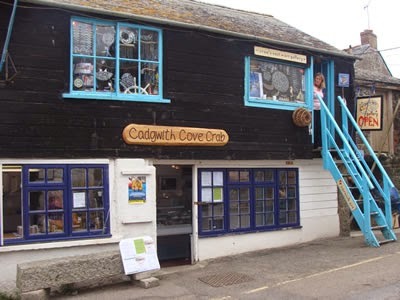 I love her lofty shop over the fishmongers, its full of an eclectic mix of hand made craft items for sale. Be careful coming down the ladder if you call in. To finish off our day of chillaxing Annies cooked up one of her Pea and Prawn Risotto specials for tea. She really is the best cook I know so I'm off to tuck in. Oh Clare how beautiful!!!! What a great town to go exploring in!!! Would have loved to have been with you!! Glad the sun was shining for you!! Did sister find the slow cooker?? Take care, have a lovely weekend and can't wait to see what you come up with next!!! Morning Clare, Wow !! what fantastic piccies, Cornwall looks absolutely stunning, I have never been myself (not been to most places to be honest !!) but would love to see it in person. 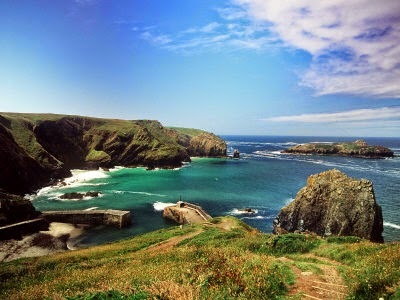 I have seen Cornwall on the tv and it always looks so picturesque, and the views are always stunning. I hope Annie got her slow cooker !! Such a lovely village. Wish I could visit it! Thank you for sharing your pictures with us. How beautiful. 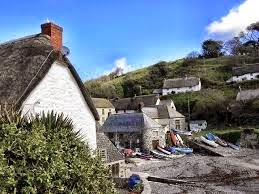 Watching Doc Martin (PBS in the States) it looks awfully familiar! Lucky you!